Has your husband been acting a little odd lately? Driving too fast, changing car lanes aggressively and cutting people off more than usual? Is he more openly hostile than ever before, while at the same time more sullen and introverted, cutting himself off from friends and family? That’s right. It may sound unbelievable, but a parasite from your cat might be toying with his brain, altering his personality – or yours, for that matter. Sound a little like sci-fi? Or maybe more like a scene from Invasion of the Body Snatchers, (from the 1956 classic or my preferred remake in 1978 with Donald Sutherland and Jeff Goldblum), where an alien life form finds its way inside a person and changes the person’s behavior to do its bidding. No one wants to turn into a human-sized pod. It’s true, there could be a nasty parasite infecting that little furball with the darling pink nose. And that parasite has migrated to your brain. Feline mind control! As a cat-lover myself, please, don’t take offence. But that could explain why you find yourself buying the most expensive gourmet cat food on the market, making sure Pineapple gets hers served fresh in a clean bowl, for three squares a day. And that designer collar with the pricey bling? She just had to have it! What is Toxoplasma gondii, or Toxo as it is more commonly known? Biologists are chewing over the possible dangers posed by our lovable housecats. In particular, a parasite excreted by cats (in their feces), known as Toxoplasma gondii – T. gondii or Toxo. It’s the tiny microbe that could be hanging out in your cat’s litter box, so mind the scooping. Toxo is nothing new in health circles; it was first identified in 1908, and up to a third of the world’s human population is estimated to carry a Toxoplasma infection. Between 10 and 20 percent of Americans are infected. But it’s a threat only to people with weakened immunity, causing dementia and odd behaviors. In the early AIDS epidemic, in fact, Toxo was considered the cause of the dementia that afflicted many patients in the final stages of the disease. But you won’t get the Toxo parasite from direct contact with your cat (don’t give up the feel-good hugs and strokes that promote good health in humans), but be careful when you’re cleaning the litter box or gardening where a cat may have done his business. Toxoplasma Gondii Experts at the Centers for Disease Control and Prevention (CDC) say that people can “get toxoplasmosis by cleaning kitty litter and coming into contact with cat stool, or touching dirt where cats might have been, including garden soil. Toxoplasmosis can also be passed to people when they eat meat that is not cooked completely, especially pork, lamb or deer meat.” Pregnant women have long been cautioned about these risks because the parasite can be passed to the fetus, causing possible brain damage, malformation or abortion. Healthy people who contract the disease don’t get sick, for the most part; they experience flu-like symptoms with muscle aches, swollen glands and a slight fever. They fight off the parasite, which then lies dormant inside their brain cells. Or so many of us in the medical community once thought. Does Toxo make you reckless by affecting your brain? There’s been recent buzz about Toxo after two decades of research into the tiny organisms by Jaroslav Flegr, an evolutionary biologist at Charles University in Prague. His thinking is decidedly unconventional: He suspects that the single-celled parasite has subtly manipulated his own personality, making him reckless and self-destructive. He reportedly thinks nothing of crossing the street in the middle of traffic. Sure enough, he had his blood tested and learned he does carry the Toxo parasite. Through extensive research, he’s found that Toxo in the brain can lead to car crashes, suicides and mental disorders such as schizophrenia. Hence my earlier questions about your husband’s odd or reckless behavior. But now neuroscience heavyweights from the likes of Stanford and the Stanley Medical Research Institute have recognized Flegr’s work – and find it credible. Many experts, in fact, say Toxo is not the only microscopic master of mind control; there may be many more parasites in animals that influence behavior. Rabies, for one, incites the infected animal into a rage while it migrates from the nervous system to the animal’s saliva. When the animal bites, the virus moves to a new carrier. Parasites want to reproduce and multiply. That’s what they’re programmed to do. Toxo can only reproduce in the intestines of members of the cat family. In clinical studies, Toxo has been shown to alter the behavior of infected rodents in ways thought to increase the rodents’ chances of being preyed upon by cats. So, if the parasite has migrated into a human brain, it wants to get back inside the cat. Not possible, of course, unless a cat eats the human host. In the meantime, though, Flegr’s research has shown that Toxo is screwing with the brains of the infected humans, changing our personalities. Which begs the question: How would you know if Toxo is messing with your mind? Flegr contends that men and women react differently to Toxo because of heightened anxiety brought on by the parasite. Women under emotional duress look for support by social bonding and nurturing. They tend to become more outgoing, charismatic and keen on improving their appearance. Anxious men, on the other hand, can become hostile or withdrawn, with little interest in their appearance. And Flegr says our behavior while driving is a strong indicator of infection. He ran two major studies in the Czech Republic. One recruited men and women participants from the general public, and the second involved mostly male drivers in the military. In both studies, participants who tested positive for the parasite were two and a half times as likely to be in a traffic accident as their non-Toxo peers. Similar studies in Turkey replicated his findings. The real danger, though, is for people who are susceptible to mental illness, or those whose immune system has been compromised. Toxo could bring on schizophrenia, obsessive compulsive disorder, attention deficit disorder and possibly other issues, changing the person’s life forever. When Flegr’s colleagues in psychiatry at Charles University ordered MRI scans of their schizophrenic patients, they found reduced gray matter in the brain. The shrinkage happened in patients who tested positive for Toxo. The parasite reportedly had done the damage. One study published in Schizophrenia Research uncovered a link between Toxoplasma gondii and schizophrenia. The researchers suggest that owning a cat as a child can increase the risk or developing schizophrenia or bipolar disorder later on in life. For their findings the researchers compared studies between cat ownership and schizophrenia. Numerous studies since 1982 have discovered a link between cat ownership and a higher risk of schizophrenia. They found that T. gondii is associated with infection that contributes to changes in behavior and less inhibitions in risky or scary situations. The infection has also been associated with a higher risk of car accidents, lower reaction times and the popular “crazy cat lady” syndrome. 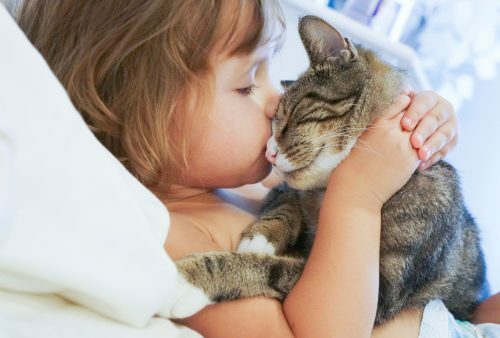 Although the study doesn’t reveal that owning a cat causes mental illness, it simply reveals a lose link between cat ownership as a child and a risk for mental illness in adult life. Far from fringe science, the threat of Toxo damage to your health is real. But don’t banish your cat to the doghouse just yet. As a doctor, I want you to take precautionary measures and reduce your risk of contracting Toxoplasma gondii. Wash your hands thoroughly with running water and soap after contact with cat feces stool and after gardening. If you are pregnant or immunocompromised, try to have another non-pregnant or immunocompromised person clean out the litter box every day. Clean out kitty-litter boxes daily, but not when pregnant. If you are pregnant or immunocompromised, keep your cats indoors. Do not feed undercooked meat to your cat. Now you’ll be prepared. Whether you can wrap your head around the mind-control theory or not, caution is the best course of action. And maybe don’t watch the zombie apocalypse show The Walking Dead all by yourself, alone, in the dark.